1/5/15. And Here We Go Again…! Being laid up in bed for much of January 1 and 2 (not a hangover, just an insidious cold), I quickly said goodbye to ye olde Gonna-Post-Everyday-This Year resolution, which is just as well ‘cause it wasn’t going to happen anyway. As much as I love the New School Year/Tabula Rasa element of opening up a fresh datebook for 2015, there’s something unhealthy in tying all good intentions (and we know what the road to hell is paved with) to one fixed point in the year. Why not start a brand new year of great things on May 17th (totally arbitrary date)? 2. BANKS – Goddess ($8.99) The jewel case was a sharp, dark red, which gave this CD an edge over FKA Twigs, whose album cover is a mess. Though I’ve had a taste of Banks’ music on my drives with Sirius XM radio, I was surprised by how not very excited I was to hear the whole thing. Played in the kitchen, while hubby was cooking, it made for a pleasant background experience. Revisited last night with headphones while I was falling asleep, there were some interesting blippy/bleepy arrangements but it didn’t have the original spark of a Lorde or an Adele, both of whom could be comparison points. When Banks strips away the excess stuff and you can hear her unadorned voice, it’s actually quite good, but it’s mostly buried in tracks that slither and slide around, never quite finding a hook or a groove. 3. 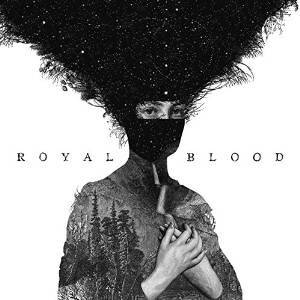 ROYAL BLOOD – S/T ($7.99) Been loving this gothic beauty of a cover since I first saw it, and the title kept popping up on Top Ten lists, so I figured why not? By the song titles – “Blood Hands,” “You Can Be So Cruel,” “Ten Tonne Skeleton” – I should have guessed that this was going to skew harder than my usual taste, but I can use a good kick in the head once in a while, and these guys have a knack for putting some blues and grunge in their heavy sound, more like a White Stripes or The Edge with more edge than a metal band. No regrets. 4. BOMBAY BICYCLE CLUB – So Long, See You Tomorrow If you’d been around the electronics department of Reston’s Target store this afternoon about 5pm, you would have heard me squeal in sheer delight. In the clearance area, where most of the stock consisted of odd lot toys and old iPhone cases, I found this album – on vinyl! – for a mere $5.06 (down from $19.99). This particular Target store hasn’t had vinyl in months and even when it did, it was powerhouse names like Beatles, U2 and Justin Timberlake. Yet somehow, this scrappy little Canadian band, which I happen to know and like, had found its way to me. I really did give a gasp of joy, like I had won a small, sweet lottery prize. Little things. Happy things. Welcome to 2015.